I love muffins of any shape and size. I decided to take out my recipe box and see what I could find to whip up tonight. These were the lucky winners. They are not a muffin that has an overwhelming lemon flavor. I opted to use the new Smart Balance Blend stick to cut back on the fat and calories. The calories listed below are with butter. Mix the first four ingredients together in a large bowl. Then stir in the remaining four ingredients. Brush when done with a mixture of 2 tablespoons confectioners’ sugar and 1 tablespoon lemon juice. Per Serving (excluding unknown items): 183 Calories; 9g Fat (42.3% calories from fat); 4g Protein; 23g Carbohydrate; 1g Dietary Fiber; 39mg Cholesterol; 217mg Sodium. Exchanges: 1 Grain(Starch); 0 Lean Meat; 0 Fruit; 0 Non-Fat Milk; 1 1/2 Fat; 1/2 Other Carbohydrates. NOTES : ** Can use lemon extract for the lemon peel. I added in 2 tablespoons. These muffins look good. 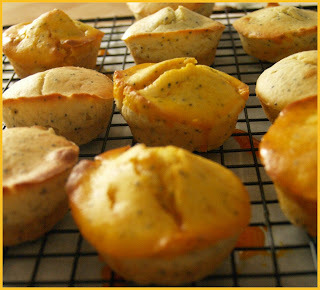 I just made some lemon poppy-seed mini-muffins, but used regular butter. Was the flavor still there with your butter substitute? The flavor is not as strong as when you use real butter and they were a bit dry. :-/ I will be sticking with the real stuff. BTW- your muffins look wonderful! !